Reflections on Georgia Politics began in the fall of 2006 at Young Harris College, as a lecture and discussion program hosted by Bob Short, who Young Harris College President (and former Georgia Secretary of State) Cathy Cox called “the most effective politician I’ve ever known who was never elected to office.” In late 2007, the Richard B. Russell Library began producing the program as an oral history video series to further illuminate and personalize the tectonic shifts that occurred in Georgia politics in the late twentieth century: desegregation and the Civil Rights Movement, the impact of Baker v. Carr, and Georgia’s evolution as a two-party state. Former governors, constitutional officers, congressmen and senators, state legislators, political organizers, and journalists have strengthened the broad net cast by Reflections on Georgia Politics. 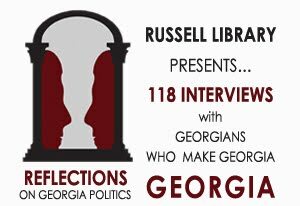 At 119 programs and counting, and almost five days of video footage, Reflections on Georgia Politics represents a tremendous historical resource. The Russell Library serves as the repository for the series, making decades of political history, strategy, and stories of back-room politics accessible to the public. For further information on the project, or to make a donation to help support the program, contact Craig Breaden, Head of Media and Oral History at the Richard B. Russell Library, at 706-542-5782, or email at breaden@uga.edu.